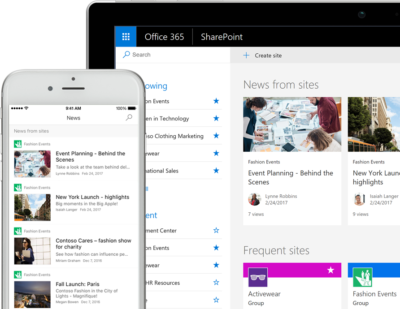 SharePoint is right at the heart of Office 365. Storing files, creating tasks, sharing news, recording data – it gives you a bag of tools to help you get your company better organised. In this blog post, we will give you an insight into the 5 benefits of using SharePoint. First launched in 2001, SharePoint often gets a mixed press. Seen by come as clunky, other companies base their whole business around it. Like most things in life, the more you put in, the more you get out… Adopted by around 200 million users and spread across 75,000 global business organisations, SharePoint is definitely changing the way businesses are run. So what are the benefits of using SharePoint? Everyday business activities made simple. Not only can users access business data to help form reports, but they can also create workflows that are specific tasks for each business process, meaning that certain actions can be automated, increasing efficiency and productivity. Customise to fit your business. Every business is different therefore you can customise SharePoint to your requirements. Either you can keep the standard features or you can have apps built specifically for what you need. Along with this, the entire site can be customised with your business branding. Collaborate better with your team. SharePoint encourages teamwork with dynamic and productive team sites for every project team, department, and division. Collaborate effortlessly and securely with team members inside and outside your organization, across PCs, Macs, and mobile devices. You no longer have to be tied to one device and you can access your documents wherever you are – providing you have an internet connection. Document Management is easier and quicker. Documents are produced on a daily basis and because of this, it is very easy for document management to go out of control. Files can be stored in many different places and formats, making the search for a file extremely difficult. Some documents could be saved on your desktop or some on a USB stick with random names. Sharepoint acts as a central location for documents, keeping everything organised in one place, and properly labelled with the use of metadata. Leading on from this, with highly advanced search features, users can find important documents or information, quickly and accurately. Security – no longer an issue. SharePoint prevents unauthorised usage as well as setting permissions for certain users. These can be applied to folders, documents, web apps and more. These 5 brief benefits all tie in together to achieve the overall goal of making a business more efficient and productive. If you would like to know more, please click the button below. User adoption quick tip number 2 of 3... colour palette!